So I thought I’d add a part two to my Roller Power Head conversion post. In the first article I covered what’s in the box when you buy the Manny Sub Roller Power Head conversion kit. And yes I was extremely impressed with the design and quality of everything that came but I hadn’t had a chance to really let loose on some fish and use the gun repetitively. 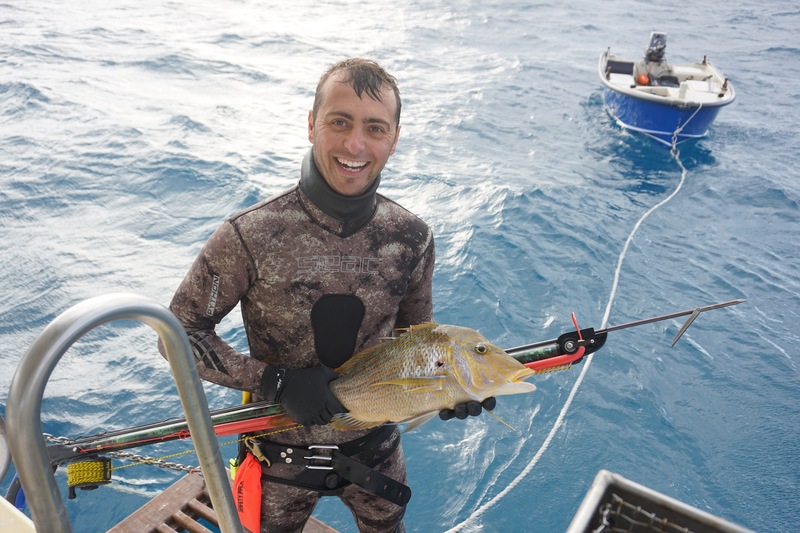 Since writing that post I have returned from the Coral sea where I was able to test the Roller Power Head setup in some of the best spearfishing grounds in the world and I wanted to share the main points I learnt, both good and bad. My setup as I have mentioned is 1.1m barrel length, 7.5mm spear with 18mm rubbers. When I arrived to the Coral Sea I couldn’t load the damn thing all the way back to the final loading fin. The rubbers are under tension the whole length of the barrel and the final loading notch is further back making it even harder to load. Add to this my Rob Allen doesn’t have a loading but so the final loading tab is very close to my chest. I’m not the biggest bull in the paddock but I can easily load guns with a 20mm rubber no problem but with this I was struggling. So what did I do? I persisted and adapted. I had to change my loading technique. With the Roller I load to the first loading fin on my hip which is easy and I can then reach the rubber with ease and place it on my chest for a conventional load. However I still couldn’t get it all the way back until I gripped the rubbers overhand which seemed to make a massive difference and made the load quite easy. I now find this gun easy to load and have no problems and when you think about it, all that extra power can’t come for free, you still need to power it up using your own strength. No.2 Don’t mess with the math. Roller Gun setup is quite particular and I think incorrect setup is one of the main reasons people fail with them. I went through major setup woes of which all were my own fault. My problem was I found the gun too hard to load so I tried to change my setup. I found some old 16mm rubber, a 7mm shaft designed for a 1m gun (incorrect overhang) and I attempted to modify it. As it turns out it was easier to load but just did’t perform the way it should have due to the spear diameter, rubber diameter, spear length and pretension ratio being all wrong. I then consulted the Manny Sub guide and basically reverted to the original recommended setup and started shooting fish almost immediately. Manny Sub have done the math for you and take it from me, you should stick to the recommended setups. Much work has gone into fine tuning the correct setup options and it’s best to pick a setup option that suits your hunting and stick to it. 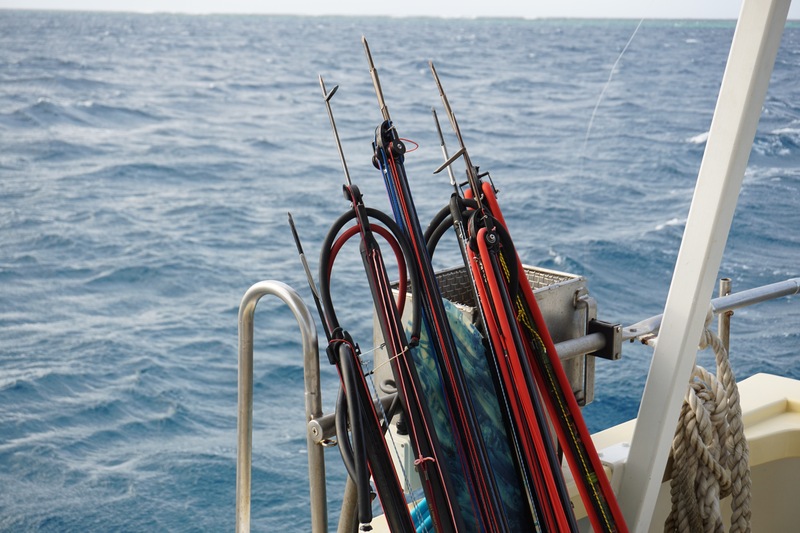 The double wrap allows you to take advantage of all that extra power but it also gives fish extra time to run into the reef before the slack is taken up on the shooting line. It is important to be quick in grabbing the line and pulling them up before it’s too late. This little Spangled Emperor made full use of the extra shooting line. No.4 Your long shots aren’t so long anymore. The visibility in the coral sea was 40m or better, so the extra range was perfect but in my mind I was still shooting my 1.2m Rob Allen. I was getting way closer than I needed to be. I learnt that with the Roller Power Head I can be further away but still be accurate with this gun. It’s never a bad thing to have a little extra length especially when you’re targeting flighty emperor species. I don’t think I’ll ever be one to shoot to the maximum range of the gun consistently but it is nice to have all that range at your disposal. Double wrap shooting line, anchor points, pre-tension, it all seems overwhelming at first and because you don’t know the gun you might start to question it. Why wouldn’t you if you’ve been shooting fish just fine with your simple single or double rubber rail gun. My suggestion is to stick with your roller gun. I had all the teething problems that are possible and even invented a few of my own, but now I could never go back to a standard speargun. It all becomes second nature. No.6 Recoil? No thank you sir I’m a gentleman!! After shooting a roller gun for a couple trips I suggest shooting a regular gun again. You won’t believe the kick they have and you won’t believe you ever put up with it. I find the lack of recoil means I don’t need to grip the gun as hard and I’m more relaxed when I shoot. I used a little 1m rail gun at the end of the trip to compare and the kick was the first thing I noticed. No. 7 So you’ve got a little one hey? When you get a Roller gun it’s generally going to be a little shorter than your mates conventional railgun but don’t worry it will shoot further and you’ll be able to maneuver it much easier due to the reduction in length. I particularly like seeing videos of large slabs of timber with fists full of rubbers hanging off them being arm wrestled through the water and I think to myself “how primitive”. It does take a bit to get used to, the fact that a little 1m roller will outperform your old 1.4m rail gun. My Roller setup is quite a heavy duty setup and I think I can go even shorter for my local conditions. I think a 90cm setup would still shoot everything in my local area and be an absolute dream to use. What I like about Rollers is that you start to think smaller. For years we have been buying bigger and bigger guns to shoot further, now we don’t have to. No.8 Stainless is a Spearo’s best friend. During our Coral Sea trip I didn’t once wash my gear in fresh water for the entire trip and then I didn’t wash my gun for another week when we returned (I was busy alright). The Manny Sub stainless steel spear looks the same as when it arrived. It’s still has a shiny polished surface and doesn’t have the white corrosion of the coated spring steel shafts or rusty tip syndrome of the oil quenched spears after they’ve hit the rocks a few times . Not to mention the tri-cut is the sharpest I’ve encountered despite being put in the reef. Everything they say about rollers is true in my opinion. They are a little more complicated but like everything it’s just about learning and mastering your craft. Roller guns do shoot further, they are more accurate due to the lack of recoil and you can use a smaller than normal gun to shoot the same fish. With guys like Chris Coates and Tanc Sade using them you know they’re the real deal and I’m now converted 4 LYFE! If you would like to know more about the technical aspects of Roller Guns then Chris Coates’ article gives a very in-depth look at setup options. I would love to hear about your experience with Rollers in the comments below and if you would like to get yourself a Manny Sub Roller Power Head you can get one here. Just remember to use the noobspearo code at checkout to save $20 on purchases over $200.